The gravity of our habits, the rightness of our beliefs and the watertight logic that allow us to enter the unknown of each day with an illusive sense of stability all contribute to the impresssion. Water drip-drop-dripping on a rock appears to splash off with a sparkly bounce, leaving the stone untouched. And yet we know how in time water washes away even mountains. Our views and perspectives seem stable, even as the winds of uncertainty blow at the edges of our awareness. We experience ourselves with a homeostatic stability. The ever-changing world outside our window moves slowly enough to create a sense of predictable, stable change. But time is a curious solvent. Which incessant drop of water on a stone is the one that wears a hole through it? Which moment in time opens your eyes to a new view, to a possibility that you’d dearly held as impossible? Or to a perspective that you had assured yourself belonged to someone else — yet now it floats through your mind, pulling with it a completely new set of feelings, desires and sense of potential? How often have you unsuccessfully attempted to convince yourself of a new perspective or practice? Tried to put down the diet soda or chemical-laden cookies the way a committed alcoholic wakes thinking today is day of redemption as he reaches for a drink? How do you put up a wall of resistance to block a new direction or belief structure you thought belonged to someone else, only to find that in the ripples of unfolding time you are coming around to a new view? Time is a curious solvent. The habits of your 20-something self and the fears you had a decade or three ago probably don’t tug the same emotional threads. Or perhaps they do, hardwired to ancient entangled emotional habits, but the meaning you make of them now brings a different story line. Most of us strive for constancy, even worship it. And yet time wears away at our bodies, beliefs and opinions. We can resist like a rusty hinge, squeak a complaint about our every move, or we can allow ourselves to realize that yesterday's solutions are often the roots of today's problems. It is not that we've chosen badly. But just as the grapevine needs constant pruning to reach its full flourishing, we too need the disruptive force of change to grow into a fuller version of ourselves. Spring is the perfect time to clear clutter out of your garage or basement, and it also is the perfect time to nourish and support your liver to detox the accumulations of winter's stagnation. As the weather changes and we feel a natural invigoration and desire to move our bodies, so too do the internal organs (and particularly the liver in the spring) seek to move into a higher state of metabolic function. One of the best Chinese herbs to both support and detoxify the liver is also a local herb (or weed, depending on your point of view): The humble and potent dandelion. Isn't it curious that at this particular season nature gives us an abundance of this particular medicinal plant? 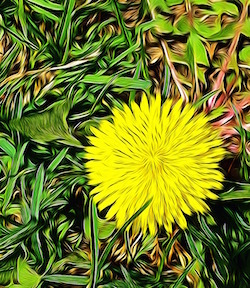 Dandelion leaves are green and taste bitter, they promote the movement of bile, cleanse the gall bladder and liver, clear inflammation, heal red itchy skin and boost the liver's detoxification function. You can add the leaves to your salad, sandwich or smoothie. Their “wild” flavor makes dandelion leaves more bio-active than cultivated greens from a store. Dandelion roots can be dug up, dried and chopped for use in a tea. Or just gnaw on a root, Euell-Gibbons style, for a burst of phytochemical cleansing goodness. And while it goes without saying, I’ll say it anyway: Use only dandelions that have not been sprayed with herbicides or chemical fertilizers. “You don’t have a right to the cards you believe you should have been dealt with. Like ice cream? Love cheesecake? Would you like to meet the love child of Ben & Jerry's, your favorite creamy cheesecake and the velvety touch of rose petals? Tracy recently started attending a monthly Raw Vegan potluck. Yeah, it sounds like a grim celebration of deprivation in the form of bland vegetables and chewy “kind of like” versions of something you love, but goes wide of the mark. 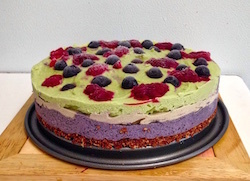 One of the things that completely and thoroughly blew my mind (and taste buds) was the “Raw Vegan Cheesecake.” I mean, really! You take away the cheese, sugar and crunchy graham cracker crust and still serve up something luscious? But don't take my word for it. Here's Tracy's recipe. Eventually we realize that not knowing what to do is just as real and just as useful as knowing what to do. Not knowing stops us from taking false directions. Not knowing what to do, we start to pay real attention. Just as people lost in the wilderness, on a cliff face or in a blizzard pay attention with a kind of acuity that they would not have if they thought they knew where they were. Why? Because for those who are really lost, their life depends on paying real attention. If you think you know where you are, you stop looking. • Need to make a decision? Get outdoors! • Discomfort is the stimulus for growth. Use it. • Sixty second mindfulness pause. You do have 60 seconds, right?